The five-mile Battle Road Trail connects important battle sites, such as the “Bloody Angle,” where eight British soldiers were killed by Colonial minute men. 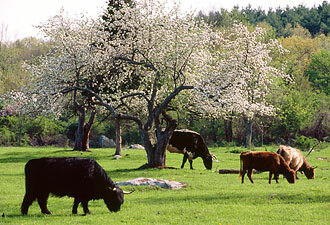 Cattle still graze in Minute Man National Historical Park's pastures, carrying on a 350-year-old tradition. NPS.gov homepage photo: A park volunteer sews her “minute man husband's” bounty coat, commonly worn by soldiers after the American Revolution began. On the first day of the American Revolution, April 19, 1775, citizens stood together and risked their lives to defend their rights. For the minute men, this was not only a battlefield. This was home. They and their families lived here, and you can discover the landscape they wrought, with its stone walls, fields, orchards, and homes. The 1,038-acre park includes the North Bridge, site of “the shot heard round the world,” the Minute Man Statue, and the first four miles of the Battle Road. The Battle Road Trail attracts hikers and bicyclists and is popular in winter for cross-country skiing. It follows the route along which patriots clashed with British regulars, taking today's traveler past woodlands, farm fields, wetlands, and Colonial homes. 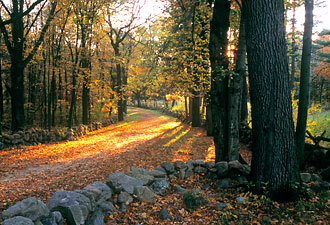 In addition to hikes and bike rides, Minute Man National Historical Park offers other opportunities. Canoe on the Concord River. View the award-winning multimedia theater program “The Road to Revolution.” Experience living history demonstrations at Hartwell Tavern. Visit The Wayside, where 19th-century authors kept alive the spirit of the Revolution by contributing to the creation of a uniquely American literature. Each year in mid-April, people flock to the park, as well as to Lexington and Concord, to celebrate Patriot's Day—a Massachusetts state holiday that honors the minute men of 1775. Parades, reenactments, and commemorative ceremonies mark the holiday, which falls this year on Monday, April 18. For a list of all this year's activities, visit http://www.nps.gov/mima/patriots-day.htm. Catch the North Bridge and Battle Road fights on Saturday, April 16. 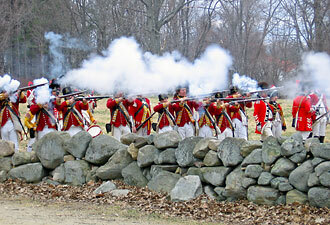 The peace of the Concord countryside will once again be shattered by the sounds of marching men and musketry as British and Colonial troops, park rangers, and volunteers bring the North Bridge battle to life. Later, hundreds of British and Colonials will stage the Bloody Angle Tactical Demonstration along a half-mile of the original Battle Road. In addition to military activities, daily life in 1775 will also be on display, courtesy of volunteer reenactors at Hartwell Tavern. Domestic arts demonstrations—of such activities as food preparation, needlework, children's games, and a Revolutionary spinning bee—will illustrate how civilian men and women contributed to the cause of American liberty. Imagine a war broke out in your neighborhood and your home was on the front line of battle. That happened here in April of 1775. Before the outbreak of war, while men were serving in their town militia companies, women were helping to maintain non-importation pacts (boycotts) against British imports, particularly cloth. Thus, common activities, such as spinning and weaving homespun cloth, took on political significance and helped unite Colonial Americans. Once the war started, with many young men away fighting, women shouldered the extra burden of managing domestic duties and household economies—a task made even more difficult by wartime shortages and out-of-control inflation. It is important, as we commemorate the battles of the American Revolution, that we also pay tribute to these unsung heroines of the war, especially in March, Women's History Month.